The plural of anecdote is not data. At any given time in any given economy you can find counterexamples. During the Great Depression, for example, millions of Americans were doing very well for themselves. It wasn’t difficult to locate and talk to those who were prospering during what was a legitimate catastrophe. It’s never all or nothing. Rather, the issue is how many fall on the wrong side of the middle. In every economy there will be those doing well and those who don’t. A truly booming economy is where the proportion qualifying for the worst categories is smallest. If there are too many left to struggle, then the whole economy will. In the end over the long run, however, it is labor that ultimately matters. This is why there are so many anecdotes all over the place lately. The unemployment rate says the economy is booming, maybe even to a level it hasn’t seen since the nineties. If that’s the case, then we should have near uniform and unambiguous data to confirm what otherwise is mere suspicion. We don’t. So, anecdotes have been a way to make do without the data, an intended precursor for the numbers that everyone is so sure will shift in the right direction tomorrow (or the next day). Time doesn’t seem to matter much here, but it has started to again in other places. This weekend we were treated to the almost simultaneous release of stories detailing the massive labor shortage in the trucking industry. It is so bad, apparently, the Trump administration is considering reducing the driving age to 18 for certain qualified applicants seeking to enter the interstate transportation business. The Washington Post, for one, suggests this imbalance even threatens to “undermine the prosperous economy.” Prosperous? There’s only one option right now for most trucking companies: Give substantial raises. Recruiters who show up daily at TDDS are offering jobs that pay $60,000 to $70,000, with full benefits and a $4,000 signing bonus. In interviews with more than 60 trainees, recruiters and people who explored trucking but decided not to take the job, most said they feel that higher pay will help but that the industry’s problems are much deeper than that. Being a trucker, especially of the long-haul variety, is a tough life. But if transportation firms are seeing a remarkable uptick in business consistent with a booming economy, why aren’t they paying the market-clearing rate? It’s as if there is some macro ceiling on all these industries who can’t find workers at the rates they are able to pay. Newspapers can supply all the anecdotes they want about some distant LABOR SHORTAGE, but it still doesn’t add up. In figures released last week, there was further bad news on the US economy. And not just the usual weak growth rates of whatever several accounts. 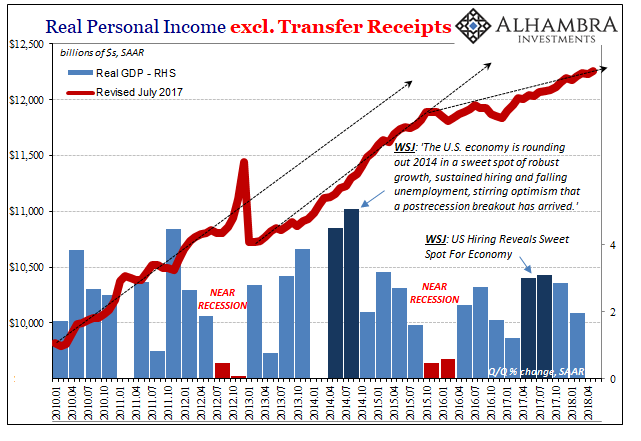 Instead, the Personal Income and Spending report relates to the very center of the economy – labor income. 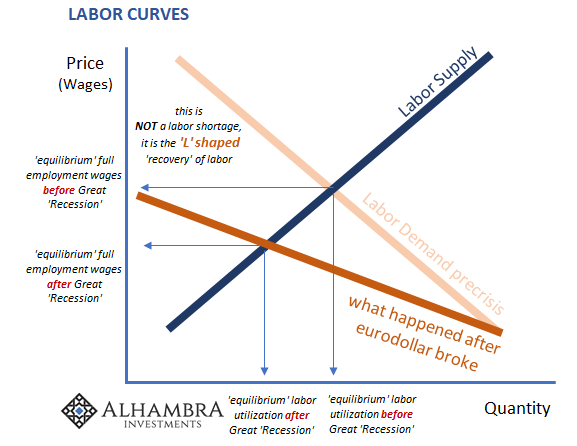 There continues to be no sign whatsoever of a labor shortage on a macro scale. 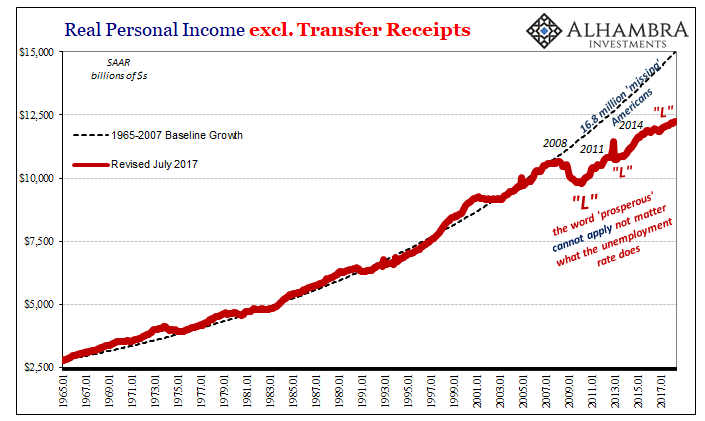 What is apparent and more importantly consistent across all the data is that since the 2015 downturn the aggregate labor income situation has become worse. It not only fails to corroborate the unemployment rate and all these stories about various individual labor imbalances, these data series are continuing to actively undermine it right through the middle of 2018. 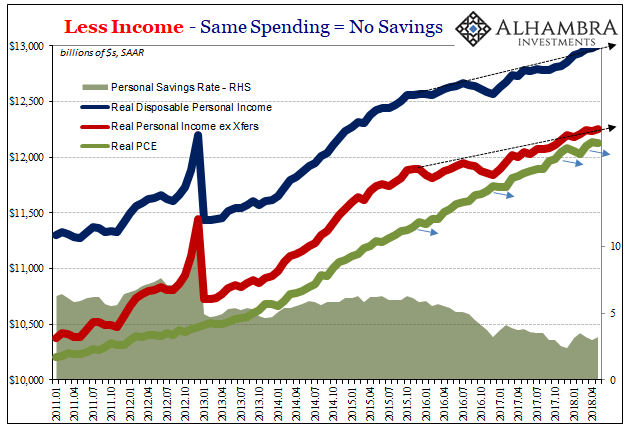 Because income growth has slowed, not accelerated, spending growth is in jeopardy. We’ve already noted the repeated phenomenon of “residual seasonality” as it relates to Christmas splurging. 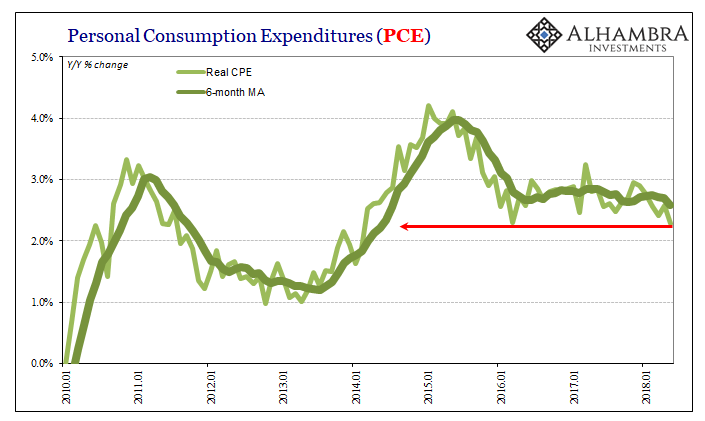 Now in the latest monthly data for May 2018 there was another decline in Real PCE for reasons separate from all that. 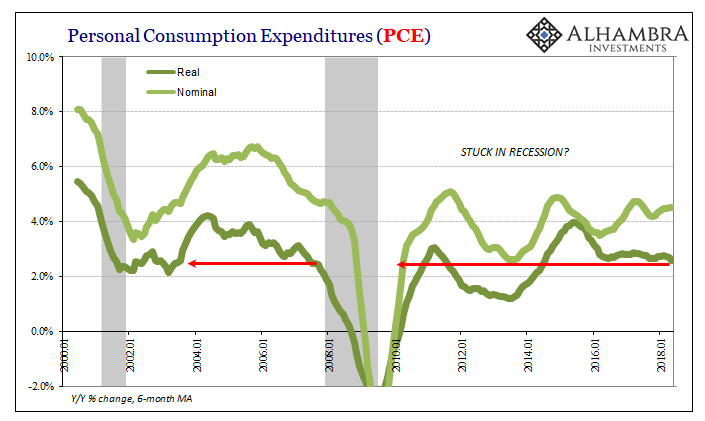 It means for all five months of this year so far, spending in real terms has been flat. These are not the data figures of a truly healthy economic system. Rising commodity prices are eating away at what little nominal growth can be found. 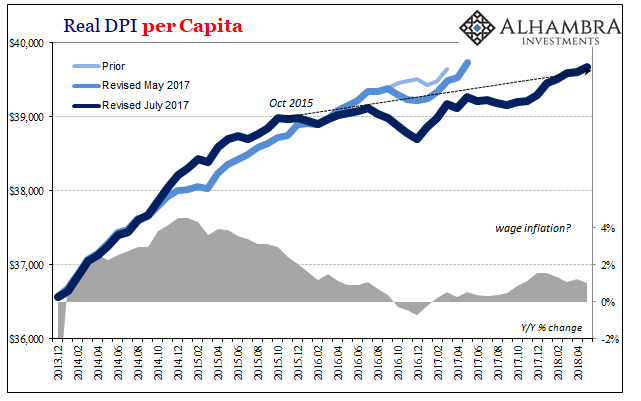 In other words, despite a 3.8% unemployment rate and all these confident anecdotes seemingly reflective of a “prosperous” economy there are far too many Americans who still cannot handle a relative small rise in gasoline prices (compared to other points in the “recovery”, such as early 2011). The plural of labor shortage anecdotes is the unemployment rate data. But one single number doesn’t come close to equaling prosperity. That’s far more elusive. 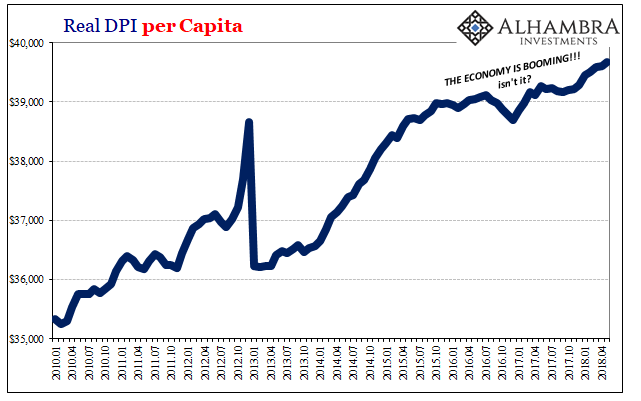 One big reason why is that honesty about the economy is missing as much as actual, meaningful growth. Economic illiteracy is rampant.